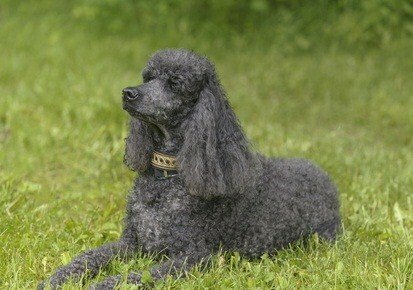 Training your dog to stay, lay down and sit are three basic dog obedience commands that every poodle should learn. Basic dog commands help dogs learn to listen to their owners. Teaching your dog the commands can be done with collar and leash training or with training treats. For training your dog to sit, take a doggie treat and move it up and over her head towards her rear end. She should automatically sit down. If not, gently place your hand on her rear, move the treat over her head again and gently press her to sit. Avoid touching repeatedly, though. You'll want her to sit by voice or hand commands only. Repeat as many times until she comes, then sits, when called. 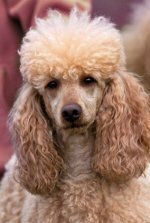 Other family members and frequent house visitors can also employ the same technique to get your poodle to come and sit before them, not jump on them. If you're training with a training collar and leash, gently use the collar to lift her head while gently pushing on her rear and say "sit". You can also, anytime, watch her when she starts to sit, say "sit" then praise her when she sits. Now teach him to stay using the collar and leash training method. In a sitting position, gently raise his head up, say "stay" and walk a few steps away. Praise him for staying. When he moves, start over again. "Stay" is an important command for stopping your dog from running onto the road with cars coming, stopping him from bolting out an open gate or open door and to stay away from household dangers. Next, teach your dog to lie down. When she is in the sitting position, say her name and "down". Move the treat to the floor then move it forward. She'll lay down to keep her eye on the treat. Praise her with "good girl!!!" If collar and leash training, have her sit and stay. Gently pull the leash towards the floor which lowers your pup's head to the floor. Also move your hand towards the floor and say "down." 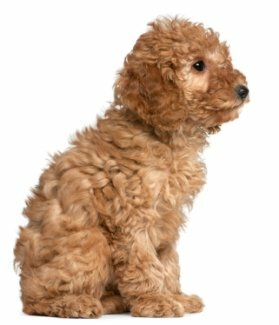 Training your dog to stay, training your dog to come, sit on command, and lay down on command are commands your poodle should learn fairly quickly. They are important commands that cause your dog to be still when she needs to be for her own safety or other concerns.